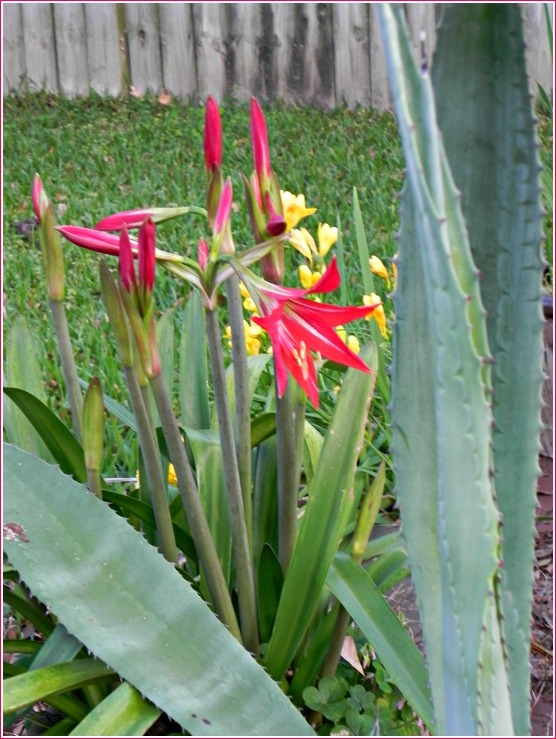 The first amaryllis to open sings a spring song and is backed up by a chorus of bright day lilies. Spring mornings can be delicious, especially if they fall on a Saturday. After the much-needed rain of this past week, this morning was a good one to take a peek at all the plants in the backyard, which I did early this morning, getting my slippers and cuffs of my fleece pants wet from the dewy grass. 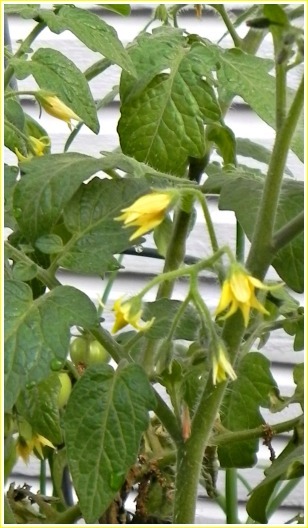 These tiny cherry tomato blooms foretell more good things to come. 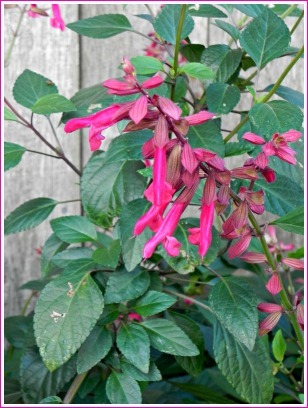 Giant salvia ready to attract bees and butterflies. 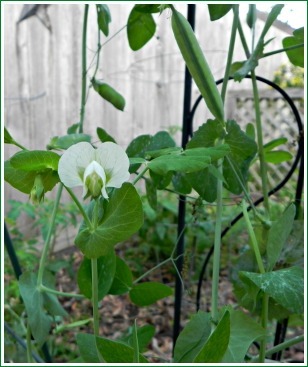 Delicate green pea blossoms await the morning sunshine. These fire spikes have made it through the cold months and continue to liven up the yard. 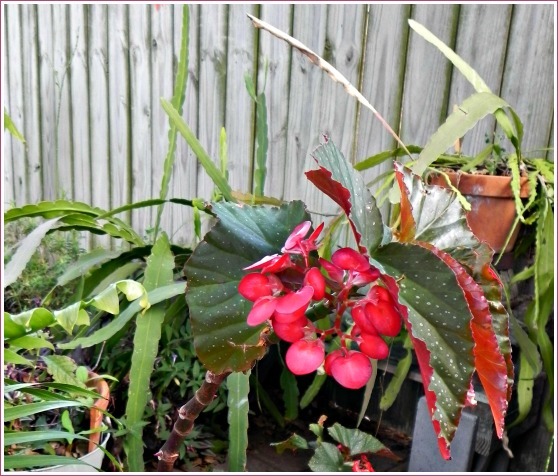 This angel-wing begonia brightens up the patio year after year. Several already pieced strips and a lot more blocks wait to be sewn together to make the top for a postage stamp quilt. Though the computer-slash-sewing room still is todo un desmadre, after getting one of my machines serviced, I’m back at piecing together a quilt top. Since I moved to my house, I’ve really only used my sewing machines for a couple of small tasks, even though one of my reasons for buying my house was to have a room that I could set up with tables for my two machines and be able to work on projects comfortably. 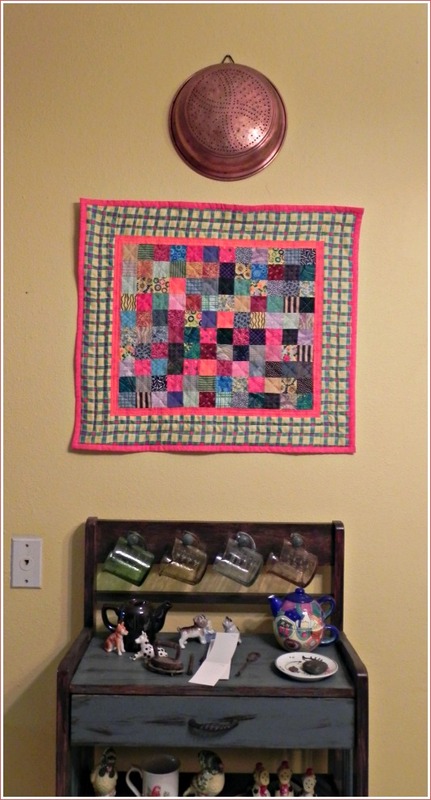 The first postage stamp quilt hangs above a stand full of my collected treasures and helps brighten the dining room. I decided that to get back into the groove, I’d go back to one of my favorites–a postage stamp quilt. I made several of these small, wall-hanging quilts a number of years ago when I was making quilts regularly. Then a small puppy came into my life, and three-and-a-half years ago, I moved to my house, and taking care of the inside and outside of my house became became more of my free time focus. Now I’m fully settled in my house, and most of the rooms in my house organized and decorated pretty much as I want. Maybe too, there’s only so much TV to be watched while hopping from site to site on the internet. Therefore, I’m once again getting the feel of manipulating the cutting wheel to make the pieces and coordinating my foot on the pedal and my fingers near the needle to join the small fabric squares. 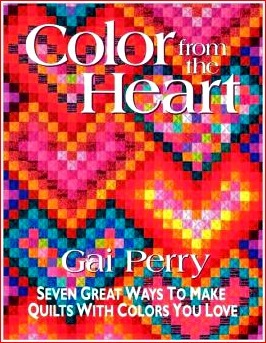 I once again dug out Color from the Heart by Gai Perry, one of my favorite quilt books. This book taught me a great deal about various aspects of using color in quilts by making small quilts like the postage stamp quilt. 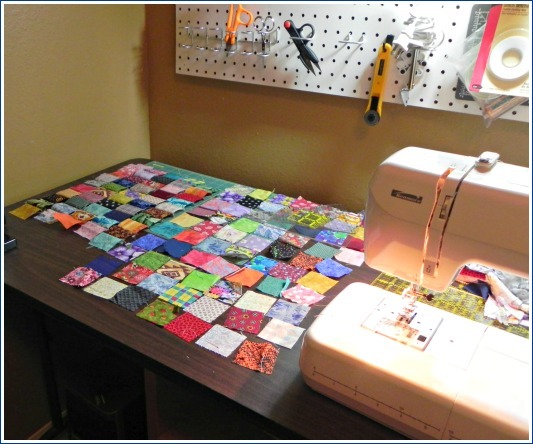 After making one of these small quilts that uses 2-inch blocks following the pattern and instructions from the book, I improvised on the design to make several others, which I gave to some of my friends. I would never let go of this book, which was published in 1999, but I see that it’s still available online. There are ideas and techniques that I’ll have to review and maybe relearn, but getting the blocks pieced into strips is already moving along. Hopefully, it won’t be long until a small quilt top will be complete. Then I can move on to layering and even doing the actual quilting! 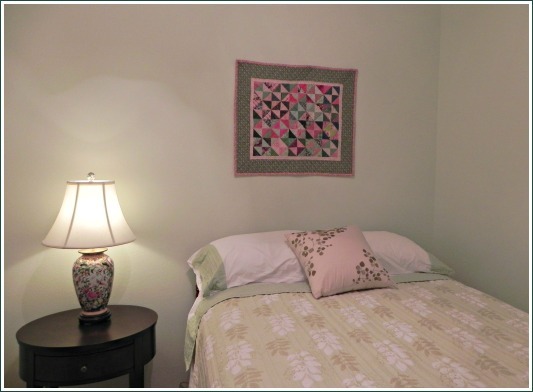 Another “project” quilt made from Gai Perry’s book hangs over the bed in the guest room. 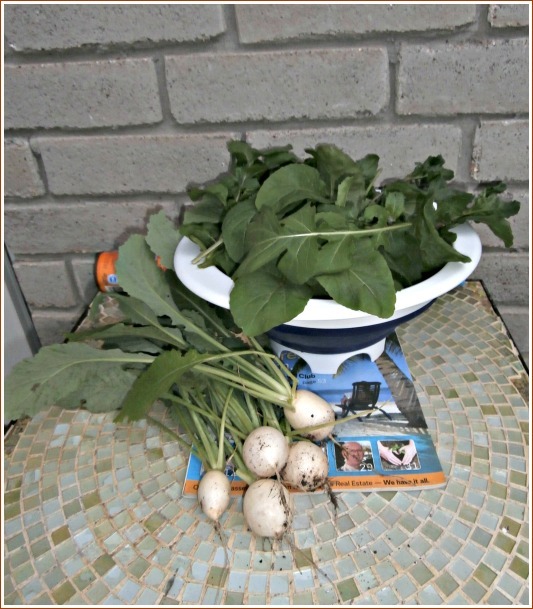 The evening’s garden pickings–a batch of lettuce and several crunchy Hakurei turnips. 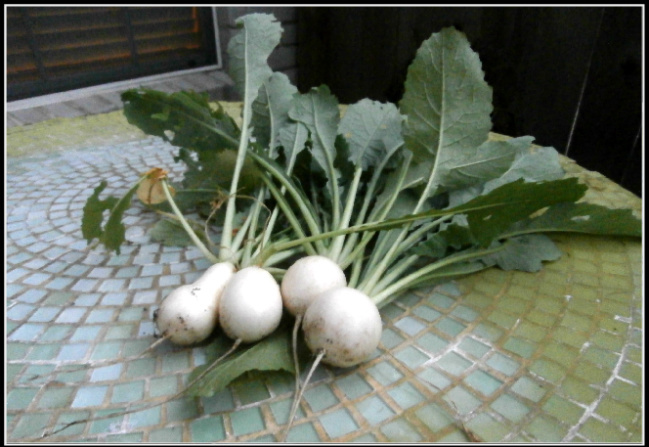 I didn’t just fall off the turnip truck, but this is the first time that I’ve ever tried growing turnips. Based on the Harris County Extension Planting Calendar, I planted turnips, lettuce, peas, and carrots in November, and of all of these, the turnips seem to be doing the best. 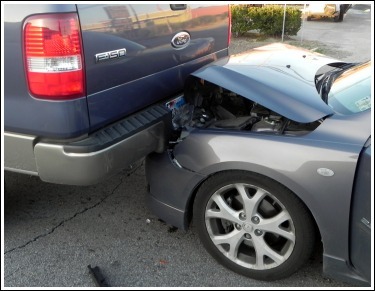 They came up thick, and I didn’t thin them, but I reckon I will be doing that as I pull up some to eat. The tops are full and green, and cover the roots, which are basically trying to push themselves out of the ground. I planted a hybrid turnip, called Hakurei, which I ordered online from Johnny’s Seeds. Overall, I like this seed company and feel like I’m getting better quality and more seeds to the packet compared to what I get at the neighborhood big box stores. Of course, with the shipping the cost is going to be more; however, Johnny’s Seeds has a fast turnaround on the order; I’ve usually gotten the seeds in my mailbox just a couple of days after I placed the order. 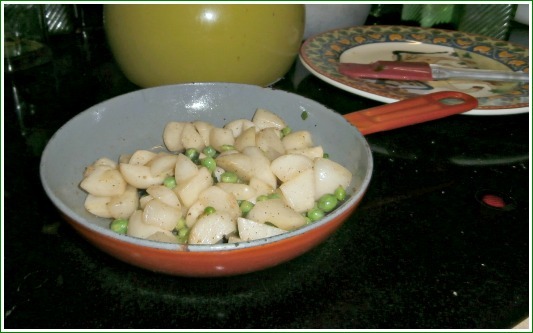 These Hakurei turnips are crunchy and have a mild flavor. I also like a turnip that has a bit of a bite, so next fall, I think I’ll plant the traditional purple-top as well. 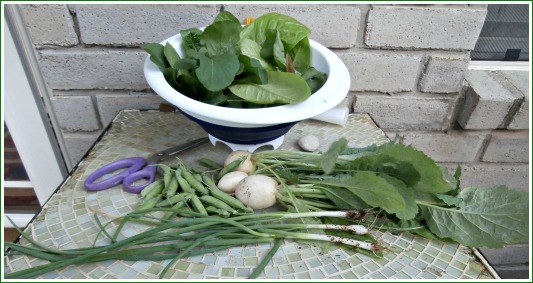 Last evening, I also picked some of the lettuce that I had planted at the same time as the turnips. A lot of lettuce had gotten washed out with the rains in December and January, so what was left had gotten mature and stemy. 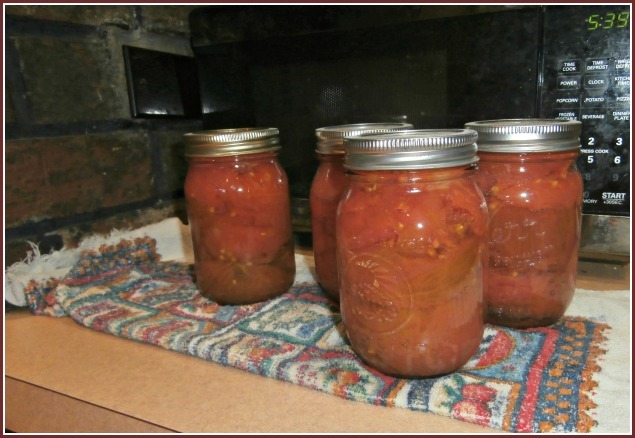 I decided to make wilted lettuce (recipe here) and try using some of the turnip tops too. Even with the combination of flavorings of fried bacon, sugar, and vinegar, the greens were just too tough to make a good salad. This morning I’ve been out in my little patch pulling up chickweed and caging tomato plants, some of which I grew from seed and some that came up volunteer from the compost I had tilled in last fall. 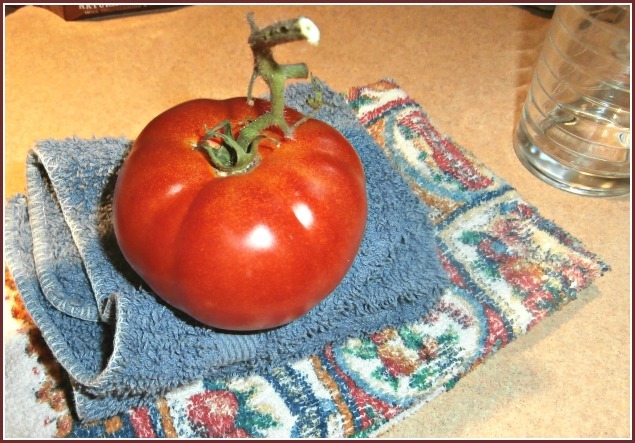 The best tomatoes I’ve ever grown are Purple Cherokees, so I ordered these and another called Green Cherokees from Johnny’s Seeds. I’m just learning to get the plants started and then transferred into the garden. We’ll see how well my little transplants do! Though my three rows of turnips aren’t that long, I’ll have plenty for snacking and salads for quite a while this spring. After they are done, in their place will go okra, which I haven’t had great luck with in the past couple of years. 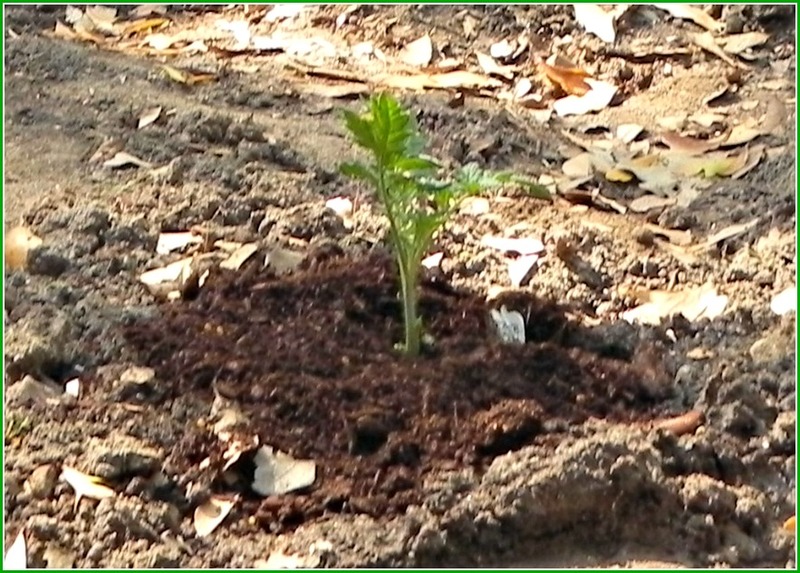 But okra is really only happy in the hot summer sun, and I probably have been trying to plant them too early.